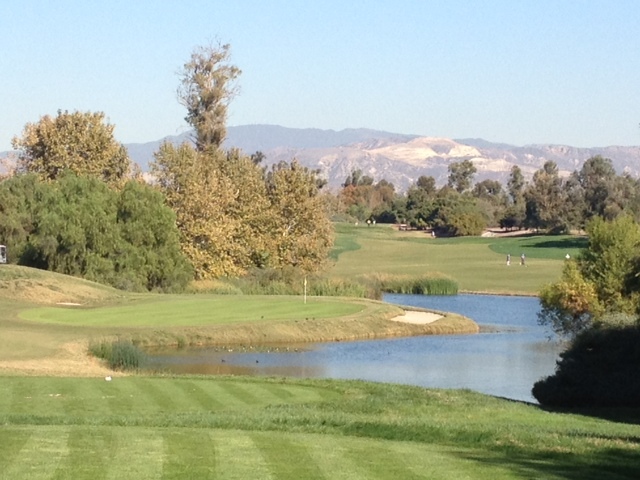 As a group, the par-3s at Oak Creek Golf Club in Irvine aren’t among the more memorable holes on the course, but this little gem is the exception amongst its par-3 peers. The par-3 3rd plays 163 yards from the Gold tees and 154 from the Whites and captures a lot of the character of the course. It’s a mid-length par-3 on a mid-length course played to a highly contoured green protected by a couple sand traps that play tougher than they look. (I, for one, would want no part of that little trap you can barely see off the back.) And obviously water looms short and right, but unless you badly push your tee shot or under club, it shouldn’t come into play. I hit a soft 7-iron that I expected to hold the middle of the green, but instead my ball trickled off the back into a collection area. From there, I hit a short uphill chip that unfortunately settled above the hole. I ended up lipping out a tricky downhill 5-footer for a frustrating four. Score aside, I enjoyed this hole and the course, which reminded me a lot of Golf Club of California in Fallbrook in how it looks, plays and feels. Besides length (GCoC is much longer), the biggest difference is the bunkers. The bunkers at Oak Creek are much more severe than anything you’d find at Golf Club of California. Otherwise, the challenge is largely the same. The greens seemed to be rolling at a merciful speed Monday. At a faster pace, I can see the challenge on the greens here being something like Barona Creek. Some tricky pin placements also accentuated the putting challenge on Monday. Anyway, if you’re looking for a round in Irvine, check out Oak Creek and come prepared to be tested on and around the greens. This entry was tagged Golf Club of California, Irvine, Oak Creek Golf Club. Bookmark the permalink.